Stacey Antine, MS, RDN is the director of HealthBarn Foundation, founder of HealthBarn USA and author of Appetite for Life, HarperOne. She is a registered dietitian with a Master’s of Science in Food, Nutrition and Dietetics from New York University. Stacey has over 20 years of experience as a nutrition counselor, speaker, writer and media spokesperson — including 18 years in public relations. She combines her passion for nutrition and health with her public relations experience creating educational campaigns for children and adults on behalf of big name food companies to drive her efforts in helping children and families eat healthy. She was honored on The Rachael Ray Show and BusinessWeek Online selected Stacey as Entrepreneurs to Watch for HealthBarn USA in “She Did it Her Way.” Stacey has been featured on over 300 television networks across the country. She has also appeared in many national and local magazines. She is appointed to the American Dietetic Association’s council for its national Kids Eat Right campaign and is an appointed member of the RD Farming and Agriculture Committee of Experts advisory group of the Academy of Nutrition and Dietetics Foundation. Joseph Lizza, CPA established is accounting firm Lizza & Associates since 1991. He received his Bachelor’s Degree in Accountancy from St. Peter’s College in Jersey City, NJ in 1978 and became a CPA in May 1981. Joe received his MBA in Innovation and Entrepreneurship from Felician College. During the course of his 24 years at the helm of the firm, he has applied his knowledge to assist many clients with what he calls” Infusion Management”. ​Since 1994, Joe has also been an active member of the business faculty of various institutions of higher education namely; Rutgers University, Fordham University, Felician College and the Becker CPA Review Company. He was awarded Teacher of the Year from the Rutgers Accounting Society, was recognized for his excellence in teaching from Becker CPA Review Company in 2005; and received the Dean’s Award for Teaching Excellence from Fordham University. Joe has been inducted as a member to Sigma Beta Delta, the International Honor Society in Business, Management and Administration and recently, he was awarded “The Five Star Top Wealth Manager’s Award in Business Planning for 2011, 2012 and 2013” as appeared in New Jersey Monthly Magazine. Darleen Reveille, RN, senior public health nurse, Garfield, N.J. Working as a critical care nurse in hospital emergency rooms and operating rooms, Reveille witnessed the devastation caused by chronic disease, especially from heart attacks and strokes. She also knew that these problems were preventable. So she left the often-exhilarating challenges of emergency medicine to become a public health nurse and help families build healthier life styles. Working with a wide circle of community partners, Darleen spearheaded the F.U.N. (Fitness, Unity & Nutrition) Partnership, which has developed some creative approaches to reducing obesity. 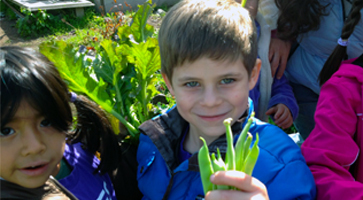 F.U.N.’s community gardens and summer camps promote physical activity and teach kids about nutrition through play, while also improving skills in math, science, and reading. She was named one of 10 recipients of the Robert Wood Johnson Foundation Community Health Leaders Award for 2012. The award honors exceptional men and women who have overcome significant obstacles to tackle some of the most challenging health and health care problems facing their communities. Skip Vichness is a senior partner in the management company Quality Camping Properties, Inc. and President of GreyPine, LLC. He oversees camping operations on both owned and rented sites and serves as a consultant to the Dime Bank of Honesdale, PA, which has the most extensive portfolio of camping clients of any lending institution in the US. He serves as a member of the Wexner Foundation Alumni Council and as Chairman of the Foundation of Jewish Camp. He holds a Ph.D. in European History and until entering camping fulltime in 1975, was a member of the faculty at Florida State University. Skip lives in Manhattan with his wife Ilana and has two sons, Ittamar and Shai.